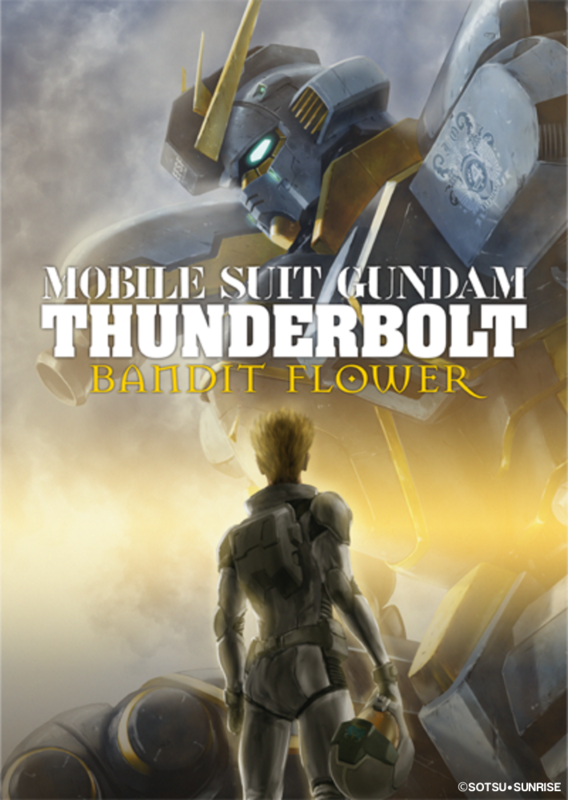 It’s not enough that we’re currently taking pre-orders for Gundam The Origin V, and will be bringing the first part of Mobile Suit Gundam ZZ to Blu-ray in September, as today we’re happy to announce we are offering fans in the United Kingdom, Ireland and Scandinavian territories the opportunity to order the upcoming import release of Mobile Suit Gundam Thunderbolt: Bandit Flower from our AllTheAnime.com web shop. As has been the case the before, this pre-order scheme at our AllTheAnime.com web shop is in conjunction with Bandai Visual and allows UK, Ireland and Scandinavian fans the chance to pre-order this upcoming release knowing it will be sent from our offices here in the UK (once stock arrives – expect in December 2017/January 2018). But as has been the case with past pre-order schemes like this, please note this is a Japanese product. Thought the main feature, Gundam Thunderbolt: Bandit Flower, will include an English language audio option along with English subtitles to accompany the Japanese audio, any additional on-disc features and/or physical items that are included as part of the product will be in Japanese only. NOTE: The deadline to pre-order by will be Tuesday 10th October 2017. After this deadline has passed we will not accept any more orders for this product. Though unlikely, should there be any additional units following fulfilment of pre-orders, they will be made available to order through our AllTheAnime.com web shop on a first-come first served basis. The product itself isn’t released in Japan mid-November 2017, so we anticipate our stock to arrive following the Japanese release date. We anticipate order for this to be shipping in late November/early December 2017. Obviously if our allocation arrives earlier than that we will work to fulfil pre-orders sooner. Please read on below for details on what you can expect with this product. Synopsis:Earth, eight months after the end of the One Year War. Captain Monica launches a secret mission, “Operation Thunderbolt,” and selects Io to pilot the Atlas Gundam. She leads the assault landing ship Spartan into a part of the ocean effectively controlled by the South Seas Alliance. Their objective is to secure or destroy the data of the Psycho Zaku, which the Alliance now possesses. Daryl, who took the upper hand in his battle with Io, has descended to Earth as part of the remnant forces of the Principality of Zeon. He has also been given the mission of obtaining information on the Psycho Zaku. Fighting alongside his new comrades, Io encounters Commander Peer, the South Seas Alliance’s border garrison commander. In the sea, on the ice field, and among the thick jungle, the mobile suits of Zeon, the Federation, and the South Seas Alliance battle each other. The war is not over yet. PLEASE NOTE: At this time exact contents of the product have not been finalised. This post will be updated accordingly to reflect product information as it becomes available. WHAT WILL BE INCLUDED IN THIS PRODUCT? NOTE: Only the main feature on the disc has English language options available. All other contents are more than likely to be in Japanese only. NOTE 2: Contents are not final and are subject to change without warning. The deadline to pre-order this by is 12pm (UK) on Tuesday 10th October 2017. The release of the product in Japan isn’t until mid-December 2017. We anticipate our allocation to arrive following the Japanese release date and estimate orders to be fulfilled during late December 2017 or possibly not until January 2018. Payment for the product will be taken within 24-48 hours of the pre-order being placed. We cannot take delayed payments on this product. The price listed at our web shop is inclusive of delivery via the UPS courier service and UK Customs Clearance. We can only fulfil orders of this product to UK, Ireland and Scandinavian countries. Any orders placed outside of those countries/territories will be cancelled. Any orders for outside of the UK for this product placed at our web shop will be only fulfilled by the UPS courier service. Please note there will be an additional international shipping surcharge. The cost of this will be added during the checkout process. That’s all for the details on this. If there’s anything additional to add we’ll be sure to say. For those living in France and Belgium, you can place an order at our French team’s AllTheAnime web shop HERE now! Please negotiate for a proper UK release of Gundam The Origin and Gundam Thunderbolt with Sunrise. I don’t mean the inflated RRP(Not your fault there) Japanese import reselling, I mean an actual UK release with an Anime Limited LE treatment. Mobile Suit Gundam Thunderbolt: December Sky was already released on DVD/Blu Ray in the United States by Bayview, surely you could do the same here? I think they will eventually release those but the older UC titles such as ZZ. CCA, Stardust memory and 08th ms team. Victory should take priority as these should have come out earlier but due to the french delay with Zeta other issues it came very late. Well.. I really hope eventually all (classic and new) Gundam series will be released in the UK/Europe.